A step-by-step guide to more synthetic, holistic, and integrated urban design strategies, Design Charrettes for Sustainable Communities is a practical manual to accomplish complex community design decisions and create more green, clean, and equitable communities. The design charrette has become an increasingly popular way to engage the public and stakeholders in public planning, and Design Charrettes for Sustainable Communities shows how citizens and officials can use this tool to change the way they make decisions, especially when addressing issues of the sustainable community. Designed to build consensus and cooperation, a successful charrette produces a design that expresses the values and vision of the community. Patrick Condon outlines the key features of the charrette, an inclusive decision-making process that brings together citizens, designers, public officials, and developers in several days of collaborative workshops. Drawing on years of experience designing sustainable urban environments and bringing together communities for charrettes, Condon’s manual provides step-by-step instructions for making this process work to everyone’s benefit. He translates emerging sustainable development concepts and problem-solving theory into concrete principles in order to explain what a charrette is, how to organize one, and how to make it work to produce sustainable urban design results. "The design charrette has gained popularity and notoriety among many communities as a powerful tool for public participation in recent years, and this book provides a step-by-step manual to harness this power. Drawing on Condon's years of experience shaping and honing the charrette process, this book is a straightforward guide that lays out the essential steps and best practices for running a productive design charrette. His advice is equally applicable to public officials, develpers and the general public—offering an insider's view into the somewhat complicated process of pushing plans forward with both transparency and an ear to the public voice." "Through considerable professional experience and superb writing, Patrick Condon has honed the public design charrette process into a sharp tool for shaping the sustainable future we all seek for our regional and community landscapes. Design Charrettes should be part of every concerned designer's tool box." Robert Thayer, FASLA, FCELA, author of "Gray World, Green Heart" and "Lifeplace"
"Patrick Condon is the master of the design charrette, and this book will become the 'Idiot's Guide' to this highly effective planning tool. Condon clearly describes how to organize and carry out a successful charrette. He also illuminates the ways that charrettes can create both the vision and the public support needed to design the more sustainable communities that we must build in coming decades." "Patrick Condon's book is designed to encourage broad community action, not individual introspection. In a time of global climate change and civic disengagement, that is exactly what our cities need today!" "I recommend Patrick Condon's Design Charrettes for Sustainable Developments. It is a valuable tool for those interested in learning more about and conducting design charrettes for sustainable communities." "The author gives a compelling description of the decline into unsustainable incoherence of post-1950s planning." 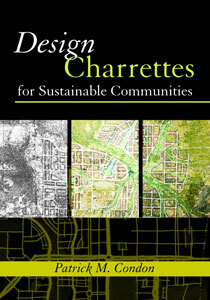 Design Charrettes for Sustainable Communities was named one of Planetizen's Top 10 Books of 2007.